A couple of good notes in black poetry news these days. First, Elizabeth Alexander is selected to read at the presidential inauguration, a high honor indeed. I'll write more about Alexander's writings here in coming weeks, but for now, it's worth saying that her poem The Venus Hottentot 1825 looms large in the extensive body of African American persona poems produced over the last 20 or so years. In other news, the NAACP announced its nominations for this year's Image Awards, and I was pleased to learn that James E. Cherry's Honoring the Ancestors was nominated in the poetry category alongside Cornelius Eady, Nikki Giovanni, A B Spellman, and Yusef Komunyakaa. I had been drawn to Cherry's poetry and various other writings for some time. 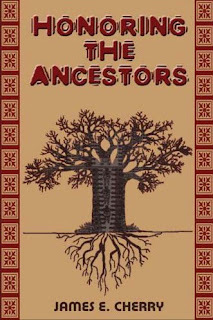 I read Honoring the Ancestors in manuscript form and ended up writing a back-cover book blurb. I noted that rarely had a single volume of poetry contained such a wide assortment of tributes to black historical figures, including Langston Hughes, Gwendolyn Brooks, Paul Robeson, and Charlie Parker. And of course Cherry's poems do more than offer praise; his verses chronicle the past from fresh and artful perspectives. Cherry's book was published by Third World Press, a black owned publisher that's been reppin' for black poets and various other writers since 1967. Surprisingly, few of its titles have been nominated for Image Awards over the years. What's the deal? So, we'll see what happens when the NAACP announces the winners this year. Since Cherry is the least known of the nominated poets, it'll be tough. Whatever the case, I'm excited that he's received this honor and that his work is getting wider attention.